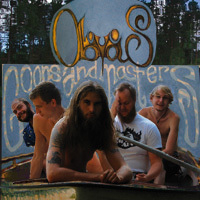 Oblivious is a new band from Linköping, Sweden. The band feature a strong and melodic vocal balanced with some great stoner rock riffs and grooves. The band clearly likes to jam it out a bit as well, with numerous solos and cool sections in their tracks. They should have mixed the vocal a bit lower though! The CD starts off with Ego Boy, which is straight and direct Swedish grooving stoner rock. If you like this genre, you will be hooked. Throne is next and has a really strong melodic thread and a catchy groove. Red Eyed Goon shows the diverse range of singer Isak. Master of Time is one of the longest tracks at 6½ minutes and also shows a different side of the band with some acoustic guitar, a more bluesy laid back start and then a killer break. Kickin and Screamin’ brings back the power with a headbanger! Bring it on me starts with some cool wah guitar and then stoner riffing takes over and you get sucked into the groove. The band really surprised you with the Dead End Night, with its organ and in a strong ballad like track. Boiling Brain is a 2½ minute fast rocker to just get your fist in the air. Blind Faith ends the CD and is another slow starter before the band take it to a higher level. Pretty impressive debut.